Birch River Grill celebrates Sweetest Day on Saturday, Oct. 17, with two special dishes offered along with the restaurant’s regular contemporary American fare: Grilled Certified Angus Beef Rib Eye Filet, crispy Yukon Gold potato rounds, wild mushrooms and red wine demi glace ($28) and Seared Atlantic Cod, cumin scented Moroccan cous cous, steamed vegetable ragout and balsamic reduction ($19). Included with the purchase of any entrée any sweet treat off the Sweet Table, a Chef’s selection of desserts with coffee and tea, including Aunt Aggie’s Carrot Cake, Birch River Grill’s Famous Triple Chocolate Column and more. Birch River Grill serves rustic American gourmet comfort food. Hours for the restaurant are 6 a.m. to 10 p.m. Monday through Thursday, 6 a.m. to 11 p.m. Friday, 7 a.m. to 11 p.m. Saturday, and 7 a.m. to 10 p.m. Sunday. The lounge stays open one hour later. All major credit cards are accepted. Complimentary parking is available. 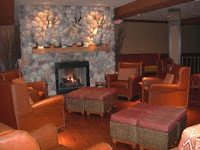 For reservations or more information, please contact Birch River Grill at (847) 427-4242 or visit www.birchrivergrill.com.